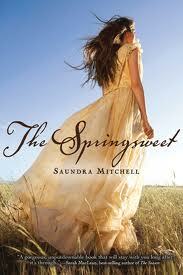 TODAY I welcome the most spectacular Saundra Mitchell to the blog to celebrate the release of her romantic, sweeping, swoony follow up to THE VESPERTINE, THE SPRINGSWEET. Take it away, Saundra! "Do you know what I've missed since coming here? Books. I do miss reading novels, don't you?" Pretty much every writer started out as a reader; now that we're writers, we can't help but write about people who love books. Sometimes IN the books. It's meta upon meta, but it makes perfect sense to us. To celebrate books, Saundra Mitchell's blog tour is all about sharing two great things that go great together: books + free. And tell us about your favorite book, too. Growing a TBR pile is the best gardening there is! It’s a long way from Baltimore to Oklahoma Territory. But Zora Stewart will go any distance to put the tragic events of her sixteenth summer behind her. So this city girl heads to the tiny frontier town of West Glory to help her young widowed aunt keep her homestead going. When another Baltimorean shows up in West Glory, Zora couldn’t be more surprised. Theo de la Croix made the long trip out west hoping to court Zora, whom he has long admired from afar. But Zora has developed an attraction to a rather less respectable fellow: Emerson Birch, a rough-mannered young “sooner” whose fertile land is coveted. As Zora begins to suspect that there may be more than luck behind Emerson’s good land, she discovers an extraordinary, astonishing power of her own: the ability to sense water under the parched earth. When her aunt hires her out as a “springsweet” to advise other settlers where to dig their wells, Zora feels the burden of holding the key to something so essential to survival in this unforgiving land. Even more, she finds herself longing for love the way the prairie thirsts for water. Maybe, in the wildness of the territories, Zora can finally move beyond simply surviving and start living. Saundra Mitchell has been a phone psychic, a car salesperson, a denture-deliverer and a layout waxer. She's dodged trains, endured basic training, and hitchhiked from Montana to California. She teaches herself languages, raises children, and makes paper for fun. She's the author of Shadowed Summer, The Vespertine, The Springsweet, and the forthcoming The Elementals and Mistwalker. She's also the editor of the forthcoming YA anthology Defy the Dark. She always picks truth; dares are too easy. Just leaving a comment to say that The Springsweet easily makes my Top Reads of 2012 list. Such wonderful story-telling. Oh crap. My favorite book?! Can't do it! But, some of my all time faves that I can read at least once every year would have to be the Anne of Green Gables series and Harry Potter. Even though I'm 30. Some more recent books that stand out to me as GREAT are: The Sky is Everywhere, The Daughter of Smoke and Bone, and Delirium. I have followed both Myra and Saundra on the twitters for a while now and would love to read these books!! My library doesn't have either of them and my husband has put the karate chop on my book buying sprees. What a great giveaway! All of these books are on my TBR list :-). I don't think I can pick just one favorite, but I just finished Shatter Me by Tahereh Mafi, and that is definitely now on my favorites list! Wanderlove by Kirsten Hubbard is my new favorite!! my most current favorite read is Scarlet by A.C. Gaughen, it's a standalone but i'm crossing my fingers for a series. My favorite book (of the moment) is The Last Echo by Kimberly Derting. I love the entire Body Finder series, which is about a girl who can sense the echo on the bodies of people who were murdered. She can also sense the same imprint on the killer. She uses her 'gift' to find killers before they strike again. My favorite part of the books (besides the kissing) is the chapter from the POV of the killer. They give you perspective about the killer's motives, but also keep you guessing. Kimberly Derting is a very talented writer, and I can't wait to read both The Essence, the second book of the Pledge Trilogy, and the fourth book in the Body Finder series. My favorite book is 'Tiger Curse' by colleen houck. it is such an amazing, unique story about two princes cursed to be tigers with only 24 mins a day being human. It's an awesome story and i've reread it so many times and I can't wait for the rest of the series to come out! My favorite book beyond the Harry Potter series would be My Sister's Keeper by Jodi Picoult. I love historical fiction! Usually I stick to WWII era, but this sounds great! Thanks for the recommendation! A favorite book? I don't know...City of Thieves by David Benioff and The Monstrumologist by Rick Yancey are both on my favorites list. My favorite book is usually one that I recently read so it's continually changing. Right now it is Grave Mercy by Robin LaFevers. Just loved the historical fantasy with some romance thrown in. My favorite book is The Hunger Games, because I love the writing, the story, and its ability to bring (and bring back) people to books. It has brought family, friends, and students together. My favorite genre is dystopia, because the characters have to focus on what matters most. I loveddddd The Vespertine, especially because of the fact that it was written with the setting in Baltimore, which is where i was born and raised and still live!!! Some of my favorite YA books are Obsidian (Jennifer Armentrout), Abandon (Meg Cabot), The Hunger Games series (Suzanne Collins), Graceling and Fire (Kristin Cashore), Article 5 (Kristen Simmons), Grave Mercy (Robin LaFevers), Die For Me (Amy Plum), and of course, The Vespertine(Saundra!). I recently read Hourglass, and loved it as well. But those are just a few. Thanks for being part of the tour!! My favorite book is The Naming by Alison Croggon. Thanks for being part of the tour, and thank you, Saundra, for having the tour! Thanks for the contest!! And, oh, my favorite book? I have so many that they'd probably fill my whole house! I have too many too count! One of them is "Troy High" by Shana Norris. And "Tempest Rising" by Tracy Deebs. I've loved both of them. They're such great books. Yay! I'm currently reading The Vespertine and loving it! My favorite book? Of recent completed reads, Lowcountry Punch by Boo Walker stands out! Thank you ladies for an awesome giveaway! I loved reading The Vespertine and would love to win it and Springsweet! I'm definitely looking forward to reading Zora's story. Thanks for the chance to win. One of my favorite book series is Rachel Vincent's Soul Screamers. I think my favorite book at the moment would have to be "Shadow and Bone" by Leigh Bardugo which was absolutely fantastic and I'm under the impression that "Insurgent" by Veronica Roth will be joining my list of favorite 2012 releases as well. I don't have one favorite book, or even one favorite series. But, I just read Purity by Jackson Pearce, and that was really good. I would love to win!!! !